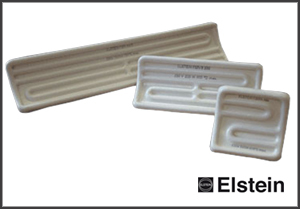 Elstein panel radiators are ceramic infrared radiators which are made using a full-pour casting ceramic process and are characterised by their concave design. Due to the design of this type, there is a space between the radiator and mounting plate, which reduces the heat absorbed by the wiring space. 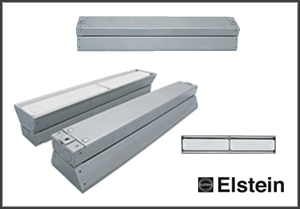 Panel radiators can be used universally and are suitable for assembling radiation areas with any geometry required. 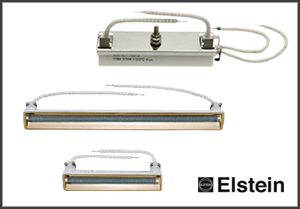 Elstein rod radiators are ceramic infrared rod radiators, which can be used for operating temperatures up to 1000°C and surface ratings up to 87 kWm2. The typical operating temperature of 1000˚C is reached in less than one minute. They are therefore particularly suitable for use in plant construction in which special solutions have to be drawn up for the customer’s specific needs and for applications requiring high outputs. 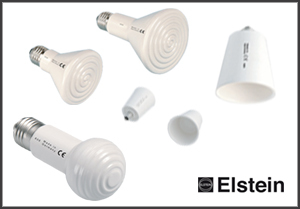 Elstein screw heaters are ceramic infrared dark heaters. Infrared heaters are suitable both for individual operation and for configuring groups of heaters. They have diverse applications, in particular they range over terrariums/pets and livestock, breeding, medical and catering technology. The ceramic body was well as the ceramic surface are mechanically and thermally stable. Infrared systems are very versatile, suited for being built to any dimensions as well as coming in a variety of lengths, not only this but these systems can be fitted with most ceramic infrared panel heaters. Their easy installation and sustainability make the infrared system ideal for a multitude of applications such as the food industry.